Born and bred on our island base of Alonissos on the Greek Sporades, Dimitris knows all the nooks and crannies that these islands have to offer. Still a local fisherman, he skippers our trips when we’re visiting. Him and his boat are a familiar sight around the waters. 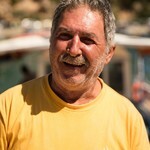 His knowledge of the waters around the chain of islands between Alonissos and Skopelos is second to none. Dimitris has been skippering for SwimTrek in the Greek Sporades since 2013.